Need something for your office to display, Starwars fans? Well this could be it! These bobble head doll looking Starwars characters are 2 GB thumb drive! 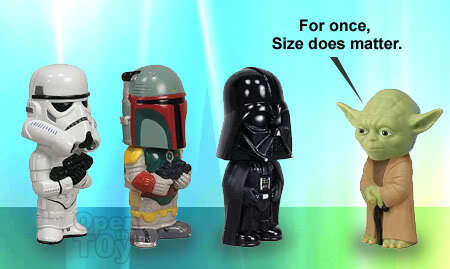 Choose from four of the ever popular iconic characters: Darth Vader, Yoda, Boba Fett and the Stormtrooper. Standing 3 inches tall with perfect blend of design and practicality, what else will you ask for? Okay maybe a higher capacity will be prefect. They will be all available at Entertainment Earth in October for $24.99. Nice but only 2GB at S$24.99..Find not worth it!! I will look for these in our toy store here. See whether they have it. for the capacity wise may not. For the design is another story. Just like the Soundwave MP3 players. Do let me know if you see that selling at your end after October. The price is very reasonable. Boba Fett and the Stormtrooper will be nice! You can order it at Entertainment Earth during october Manetoys. It's worth it!